look who showed up, originally uploaded by jahansell. I promise I won't overdo it with the spring flowers this year. 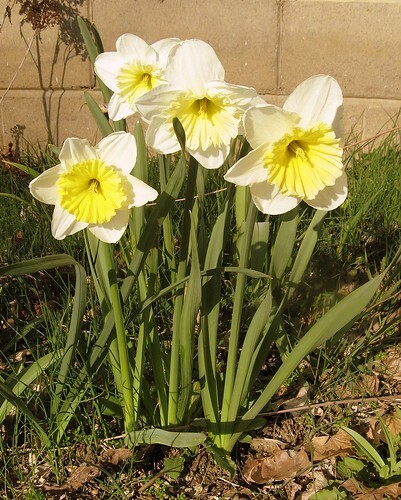 But these daffodils are so happy! Today it was 80 degrees and perfectly sunny - we cleaned up the garden, assembled a trampoline we bought in December, and had our first cookout of the season. Perfect! I spotted a couple crocuses the other day, but they were crushed by our recent snow. I can't wait to see the daffodils, but probably not for a few more weeks. So from someone who lives in the far north, you can never post too many spring flowers. They're gorgeous! Thanks for sharing! 80! we are having a slight dip down here . . .